With increased regulations aiming to reduce the danger of identity theft, paper shredding offers a wonderful business opportunity for someone looking to establish a profitable small business. As in starting any recycling business, there are a number of considerations. It’s never a good idea to start a business without knowing the current players in a market. Analyze local competitors. Identify any niches that might be under-served. Is there room in the community for a new entrant? Before looking for funding, it is crucial to create a business plan first. There may be free resources available to help in this regard, such as the local economic development corporation. They can offer funding ideas, including applying for a SBA-approved loan through a local bank, or other sources. When considering starting a new business, it is also a good idea to reach out to the relevant trade association--in this case, the National Association of Information Destruction, and also to read relevant industry publications such as Security Shredding & Storage News. Trade associations can help connect you to small operator members in other parts of the country, while case studies featured in trade publications can prove useful. You will require equipment and space. If you have a facility-based shredding operation, a commercial location will be needed, but even with a mobile service, you will still need some room for baling and storage as well as a loading dock. In terms of staffing, veterans of paper shredding start-ups say it is always good to start with at least two individuals doing all the activities. One can do the marketing and find new businesses looking for paper shredding services and the other can perform other activities. You will need at least a van or small truck, shredder, paper baler, pallets, paper bins, and pallet jack. Prices for mobile shredding trucks vary by model and year, and you can save money by purchasing a used vehicle to get started. A pre-owned, 2000 International 4700 equipped with a Shred-Tech MDS-25 capable of shredding 3,000 pounds of paper an hour, costs around $56,000, while a smaller pre-owned 2002 Freedom Renault-equipped with a Shredfast MCTT costs around $27,000. However, a new truck is $200,000- $300,000. The job can be done using a plant based shredder. The cost is slightly less. Additionally, it is possible to utilize a 3rd party shredder and pay per ton. While normal business advice applies in terms of small business licence and permit requirements, one author stresses that "a paper shredding business is really in the safety and security field, so you may need to have certain permits or licenses from your community in order to operate legally." Marketing efforts will be required to get your business rolling. Usual small business marketing best practices should be considered. Make sure to offer something unique and strive to build long lasting relationships. One potential point of differentiation is receiving Certified Secure Destruction Specialist Accreditation from NAID. Helpful Tips: The overall US paper shredding market is very competitive with downward pressure on costs. 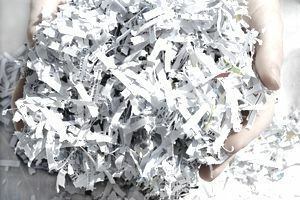 Security and Confidentiality are the keys to success in paper shredding business. In fact, these two words should be the main selling points. Make sure you know local laws relating to identity theft and deliver a proper destruction certificate at the end of each shredding operation.